If advanced features and simple functionality has appealed you and you wish to switch from Outlook Express to Outlook, then you can choose DBX Converter freeware that proffers you a way to convert DBX emails, contacts, calendars, journals, notes etc to PST file format. This freeware to convert DBX to PST acts as a mode to evaluate strength of the software as how proficiently the software performs the conversion process. Switchover of Outlook Express to Outlook 2010 can be you decision due to many reasons like elevated features offered by Outlook, job change, different email platforms etc. In such situations, there arises need to convert DBX data to PST so that files with extension .dbx become readable in Outlook PST. Our DBX converter freeware allows you to check how skillfully the software works, allowing you to know the tool before purchase. Consider a Scenario: Suppose Outlook 2010 is used in your present office but you used Outlook Express at in the previous company where you worked. For that reason, you need to convert DBX emails to PST so that you can read them in Outlook. 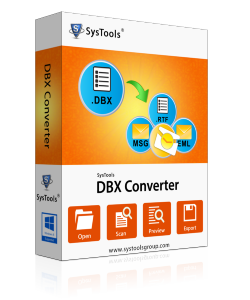 For quick and reliable conversion of DBX to PST, an external tool is necessary.